Tips and resources to help families prepare for, plan and finance a college education for students with autism. College is definitely a viable option for many people who have autism and related disorders. Success is certainly attainable for college students with autism who receive the support they need in order to thrive academically, functionally and socially. A few postsecondary education institutions, such as Marshall University, have programs specifically designed to support students with autism spectrum disorders. Others are able to offer assistance through campus disability and student services offices. The Organization for Autism Research has even produced a video to help college professors understand the needs of students with autism. In addition, organizations such as Achieving in Higher Education with Autism/Developmental Disabilities (AHEADD) and College Living Experience (CLE) assist students who have autism and other disabilities hone their academic, social and independent living skills. 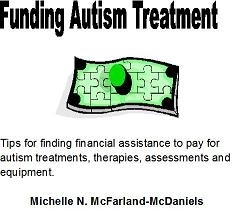 The "Funding Autism Treatment" PDF book is now available for only $4.99. MS Word versions are available for those who prefer them. To order copies, send your contact information to autismassistanceinfo@yahoo.com with the words "Funding Book" in the subject line." The transition to college life will likely be more challenging for students with autism than for their neurotypical counterparts. The key to making this process as smooth and seamless as possible is to begin preparing for college as soon as possible in your child’s academic career. 1. Incorporate college planning into your child’s IEP process as soon as possible. 2. Make developing the academic, social and independent living skills necessary to succeed in college part of your child’s transition plan. 3. Discuss college and career options with your child early and often. 4. Play an active role in helping your child choose a college home. 5. Prepare thoroughly for visits to prospective colleges with your child. You will want to inform admissions counselors about your child’s unique individuals needs, arrange to sit in on classes and spend the night in a dorm, inquire about the availability of peer mentoring and determine what services and supports the institution is prepared to provide in order to meet your child’s needs. A comprehensive assessment of your child’s needs, a holistic approach to college planning and thorough preparation for the college transition process will help make moving on to college a positive, productive and successful experience.